In this lesson, we will learn how to find points of intersections between circles and lines. Consider the circle ( 𝑥 − 5 ) + ( 𝑦 + 2 ) = 2 5 2 2 . 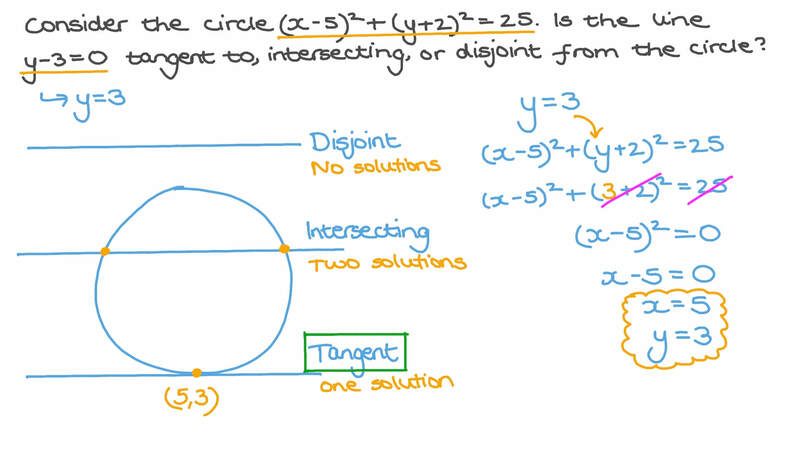 Is the line 𝑦 − 3 = 0 tangent to, intersecting, or disjoint from the circle? Which of the following points lies on the circle 𝑦 + ( 𝑥 + 6 ) = 1 4 4 2 2 ? The line − 4 𝑦 − 3 𝑥 − 2 = 0 meets circle 𝑥 + 𝑦 + 6 𝑥 + 4 𝑦 = 0   in points 𝐴 and 𝐵 . How far is the centre of the circle from 𝐴 𝐵 . Which of the following is a point of intersection between Circles 𝐴 and 𝐵 where Circle 𝐴 has radius 10 and center (9,3) and Circle 𝐵 has radius 5 and center (0,7)? Which of the following is a point of intersection between Circles A and B where Circle A has radius 13 and center ( − 7 , 7 ) and Circle B has radius 5 and center ( 9 , − 1 ) ? Which of the following points lies on the circle ( 𝑥 + 1 ) + ( 𝑦 − 2 ) = 4 2 2 ?